So……first things first. Before we dive into the specifics of taste, we need to discuss the name. Ginger Zingers. 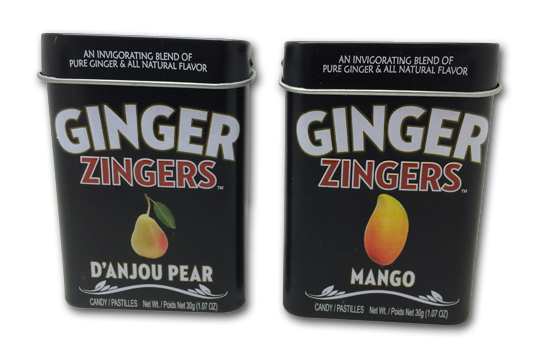 Is is it pronounced like “Jin-jer Zin-jers”, or “Jin-jer Zingers?”? Think about it. Regardless, I was intrigued. I love the packaging, the font choices, the fruit choices: all good stuff. These are basically glorified mint-type candies, like Altoids. More on those later. As you can see, the tablets have that familiar pill-like medicine look. I first tried D’Anjou Pear, as it sounded so damn exotic and probably made up. If not made up, then clearly a cred grab-either way it was intruiging. As soon as you pop one in your mouth….well…not a lot happens. I didn’t get a lot of ginger, and I certainly didn’t get pear, unless the D’Anjou pear is a special variety known for having no flavor. Shortly though, the ginger comes, and it comes strong-which I like. But for me, the pear *almost* made an appearance, but all I got from it was a one note sweetness that was quickly squashed by the strong ginger. At first I thought my palette must have been messed up, so I waited a while and tried another-same results. In fact, what little pear flavor I got, I found a little off-putting. It just wasn’t tasty. So I moved on to the mango. In short, more of the same, but slightly better. If I needed to pick, I’d go with the mango, as it stands up a bit better to the ginger-but again, the flavor of the mango is bland. No edge. And this is a shame, because the ingredients are all natural in these, so I was hoping for a more realistic representation of the fruit. Perhaps it’s because they used pear and mango powder-I bet thats strips the flavor right out. Another thing, albeit small, that bugged me about these was the consistency. You know how Altoids, especially their (excellent) ginger variety crumbles a bit in your mouth? I like that. As it crumbles, the flavor gets all up in your grill. But these kept their vitamin C-like tablet consistency the entire time-forcing you at some point to crush it up to get that elusive deep flavor. But when you do crush it, you just get crushed chunks swimming around in your sad, sad mouth. I love ginger, and I enjoy ginger candy. 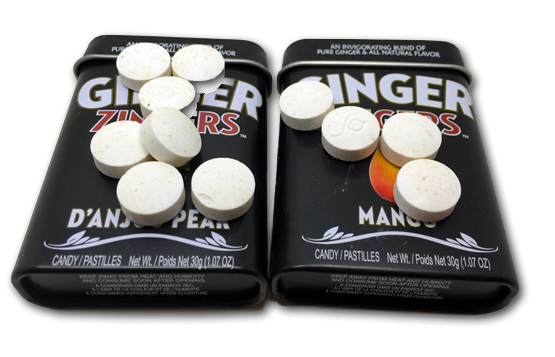 But if you’re going to do a ginger fruit pairing, you have to make the fruit tangy-otherwise, it doesn’t offer a “yin” to the ginger’s “yang”. I can’t recommend these. If you want something like this, done much better, Altoids is your answer. Confused. Are you saying you’ve never heard of Anjou pears?